HardyPet Premium Fish Oil is specifically formulated just for dogs. Optimal EPA/DHA balance, The DPA difference, Precise dosage pump dispenser, Triple Filtering for purity and always domestically sourced from sustainable fish species. There is not a better fish oil for your dog. Our enhanced customer account interface allows you to view, track and edit your autoship order at any time. Why Is Fish Oil Important? Omega-3 fatty acids are considered essentials fatty acids (EFAs) for humans, as well as for dogs, because they cannot be made in the body. In order to maintain optimal health and wellness, these fatty acids must be obtained through diet or supplementation. EPA and DHA are necessary structural components of cell membranes. These functional, health-promoting fatty acids maintain the cell membrane fluidity and permeability needed for healthy functioning cells. Two of these health-promoting omega-3 fatty acids are eicosapentaenoic acid (EPA) and docosahexaenoic acid (DHA). EPA and DHA are long chain omega-3 fatty acids found abundantly in fish. One of the key functions of the omega-3 fatty acid EPA is supporting the body’s natural anti-inflammatory response. Dogs can suffer from numerous inflammatory conditions that can affect their health and well-being. Studies have shown supplementation of omega-3 fatty acids from fish supports dogs with inflammatory conditions associated with the skin, joints, kidneys, and heart. In addition, EPA is known to promote healthy triglyceride (fat) levels within the blood of dogs. In puppies, the omega-3 fatty acid DHA plays a key role in neurological (brain) and retinal (eye) development. Studies have shown that feeding pregnant dogs omega-3 fatty acid-enriched foods during gestation and lactation provides needed DHA to their puppies. Puppies weaned onto foods with DHA have improved electroretinographic responses (a measurement of the electrical response of the retina in the eye to light stimulation), and improved responses to training tests. Studies in humans have shown that omega-3 fatty acids may be beneficial in maintaining normal cognitive function later in life. Because dogs are limited in the total amount of omega-3 fatty acids they can have in one day, it is important to balance the amount of EPA and DHA as close to 50/50 as possible. Most fish oil products that are made for human consumption and marketed for canine use contain 60% EPA and 40% DHA. This results in dogs receiving a lower amount of DHA than they need each day. HardyPet Premium Fish Oil is formulated specifically for dogs and contains 53% EPA and 47% DHA. This balanced approach provides the maximum amount of DHA which is a key component of a healthy canine diet. One of the lesser known omega-3 fatty acids has caught the attention of the medical and scientific community in recent years: docosapentaenoic acid (DPA). Recent research indicates that this omega-3 fatty acid can play a substantial role in disease prevention and proper nutrition. A recent ground-breaking study that demonstrated DPA can have a protective effect against the normal cognitive decline due to aging. Normally, during the aging process the cells that comprise the brain lose some of their connections. These “synaptic connections” are essential to learning and memory, and researchers have demonstrated that rats fed DPA were able to preserve these synaptic connections and, hence, concluded that DPA can help restore some of the cognitive decline seen in normal aging. Additional studies have shown that DPA can carry out a protective role in cardiovascular health. Specifically, two clinical studies have demonstrated a positive correlation between DPA and preventing cardiovascular disease in Canines. Scientists concluded that these protective effects are most likely due to DPA’s ability to reduce inflammation, endothelial cell migration and proliferation, and angiogenesis, which are some of the major biochemical and cellular pathways that can lead to arteries developing plaques which contribute to cardiovascular disease and heart attacks. 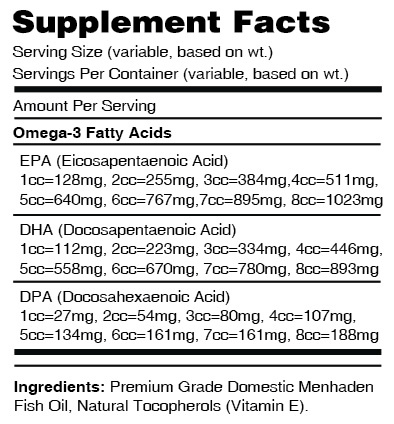 Not all fish oil products contain significant levels of DPA and most contain none at all. HardyPet Premium Fish Oil contains the highest level of this key omega-3 fatty acid which is critical to proper canine development and longevity. Treatment for cancer, joint, heart, kidney, skin and intestinal problems, as well as geriatric dementia, often include generous amounts of fish oil and its abundant DHA and EPA omega-3 fatty acids. The positive effect on skin and coat quality has moved large numbers of dog owners to add fish oil to the diets of their young and normal pets. Overall, the trend to supplement with fish oil is positive for pet health, but there is a flip side to that coin. Too much of a good thing may have adverse effects on health. Giving your dog a fish oil softgel product that doesn't allow for proper dosage can be very risky as well as fish oil products that don't properly recommend dosage based on weight. HardyPet Premium Fish Oil Recommends eight different dosage levels based on the size of your dog which allows for all of the fish oil benefits without the risk of side effects from receiving too much. One of the problems with most canine fish oil products is a need to use spoons or scoops to properly measure once or twice a day. 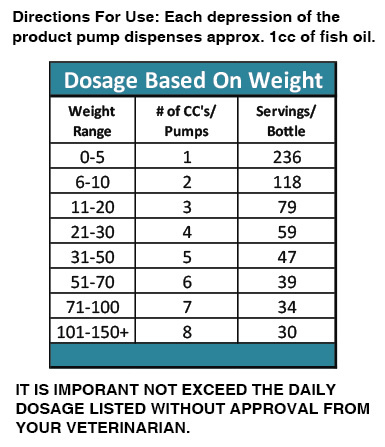 HardyPet Premium Fish Oil is packaged with special pump on the top of the bottle which precisely measures and delivers the same amount of product every time. Each time the pump is depressed, one (1) cc of fish oil is dispensed. By following the dosage recommendations on the label, it is easy to give your dog the right amount of fish oil, and without the mess or inconsistency of other fish oil products. Is Your Fish Oil Safe? Because fish may build up toxic levels of mercury in their flesh over the course of their lifetime, there is always concern that toxins may be present in oil supplements. Our manufacturing process uses several steps in processing which Triple Filter our fish oil which removes all harmful environmental toxins such as heavy metals, PCBs, dioxins, and furans. The HardyPet purification process is a unique oxygen-free, chemical-free, and low-heat processing technique that allows us to maintain the integrity of delicate oils while also eliminating potentially harmful compounds. The result is that your dog consumes only the pure, fresh, health-promoting omega-3s they need.